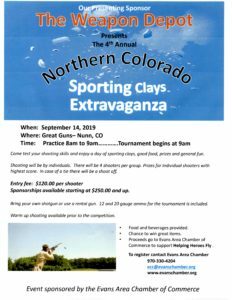 Please join us on Saturday, September 14, 2019 from 9:00am-2:00pm for a day of shooting and fun! Come test your shooting skills for a good cause! Good Food, Drinks, and Prizes for shooters. Proceeds go to the Evans Area Chamber of Commerce and Helping Heroes Fly!! Thanks to The Weapon Depot for being our Presenting Sponsor again this year! !